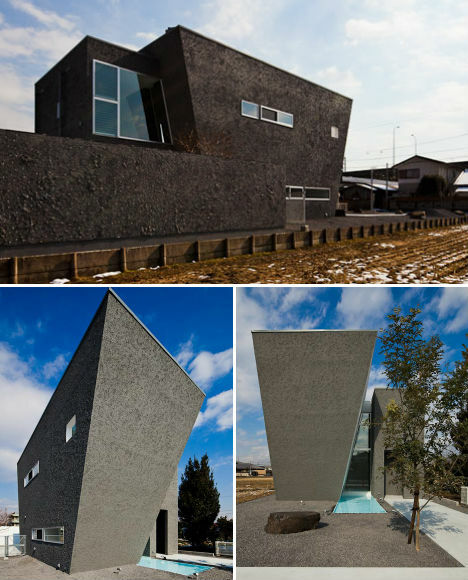 Monolithic and dramatic, the two-story Ginan House by Keitaro Muto Architects is a wedge-shaped residence with a dark gravel-covered exterior that contrasts beautifully with a stark white interior. 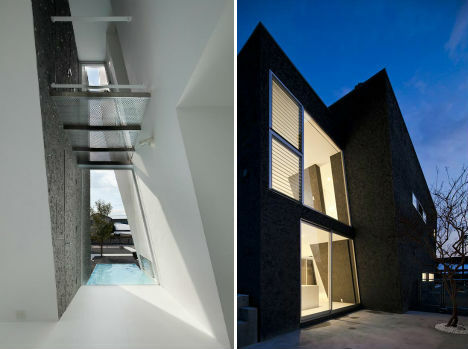 Located on the far end of a long and narrow plot, the house features a small swimming pool that extends into a glass-walled niche to create shimmering light effects inside. The rough surface of the outside walls continue indoors, producing sharp transitions in color and texture from one wall to the next. 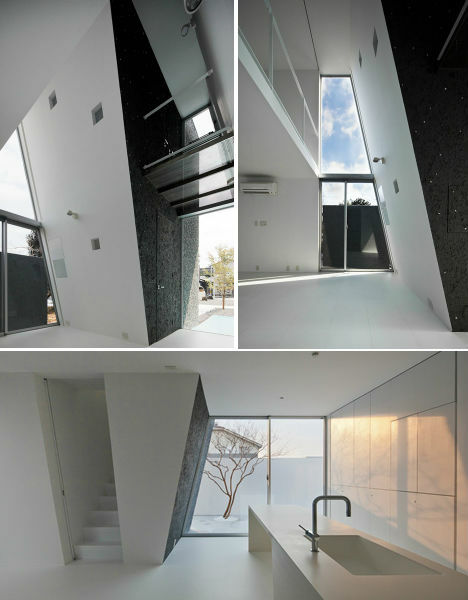 Vast expanses of white elongate slanted interior walls, and voids throughout the home let streams of daylight in. 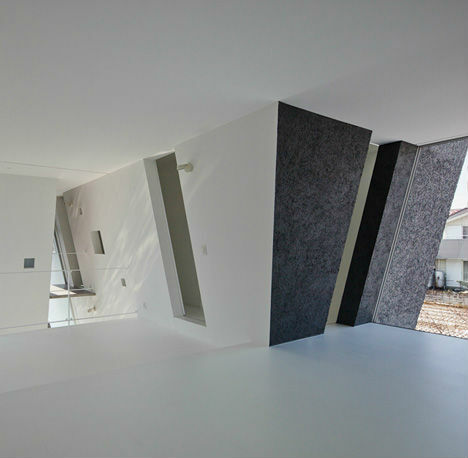 Another interesting feature of the inside is a metal bridge that extends across one of these voids to enable access to a walk-in closet and bathroom. 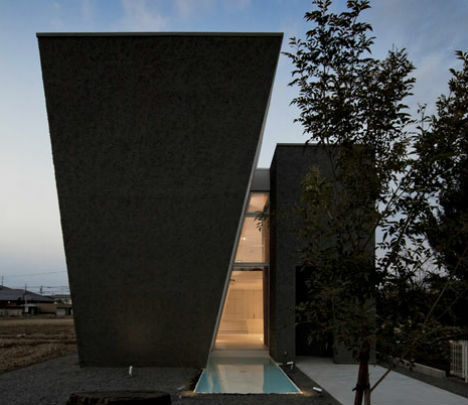 The client requested that the architect leave most of the home site as a garden space. 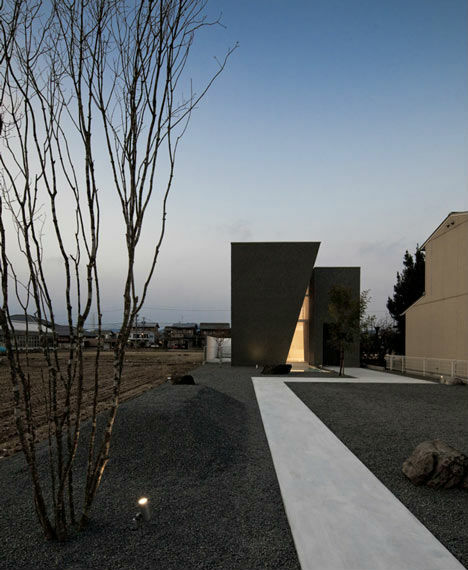 In covering the home with the same gravel that makes up the surface of the garden outside, the architects made the residence seem as if it’s an extension of the garden – one massive sculptural object to contemplate from a quiet place.